October 2008 - Flying the Tennessee River - - PAGE 273. October 2008 - Flying the Tennessee River · · PAGE 273. October 5, 2008: Marty took this photo as we turned south again with the old Hale's Bar Dam power house coming into view. Yes, the dam is gone, replaced by the newer Nickajack Dam which is further downstream from this location. The support bar for my windshield roll bar is reflected off the inside of the windshield. I had Marty fly the airplane while I snapped this shot of the area. Hale's Bar Marina and the old US 41 bridge across the river are visible ahead. I resumed flying the airplane and Marty got this shot of barges anchored in the river, the US 41, 64, 72 highway truss bridge, and the Interstate 24 bridge in the distance as we passed the marina. The new Interstate 24 bridge seen below is south of the Hale's Bar Marina and the US 41 bridge across the river. 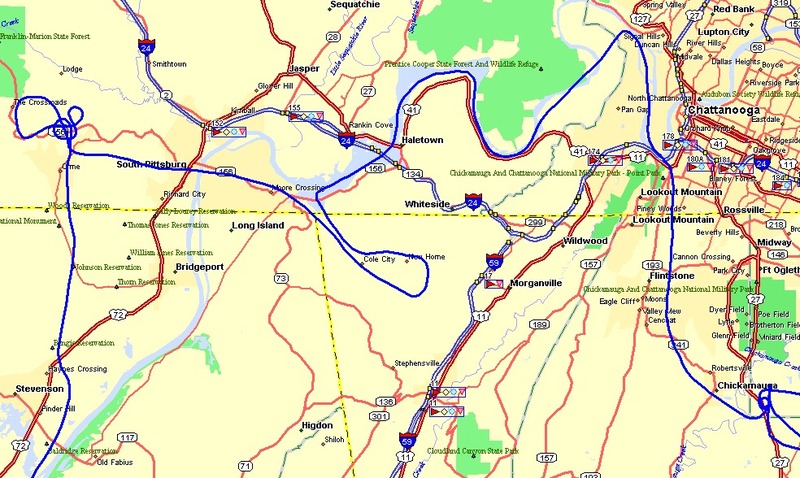 This is the GPS map overlay of the flight through the "Grand Canyon" of the Tennessee River. And yes, we did cut the corner on one bend of the river. I also flew over my grand mother's old place on Sand Mountain, near the New Home community in NW Georgia. Those turns out west of South Pittsburg, Tennessee were over an area where Marty did some work on a cable television system a few years ago. We are at a location on the river called Grays Bluff. The prominent mountain face in the distance is called Kings Point above Kimball, Tennessee. That is the small town located at the point where US 72 splits from US 64 and the original US 41 route. There is a Wal-Mart Super Center there since it a confluence of highways and an exit from Interstate 24. And yes, that is the Tennessee River in the distance between this location and Kings Point in the distance. Look at the map above to see how the river winds its way westward before again turning south into Alabama at South Pittsburg, Tennessee. That is Barton Hollow on the left up ahead. It is a controversial place since it is in dispute between the State of Georgia and Tennessee. The Georgia state line is less than one-tenth of a mile south of that water from the Tennessee River. With the continuing drought in Georgia, their state legislature passed a resolution to get the state line between Tennessee and the bordering states of Georgia, Alabama, and Mississippi moved to the designated position of 35 degrees north latitude. When the line was first surveyed in 1818. You can find the details at this link to MSNBC. And the last photo on this page shows the new Nickajack Dam and Lock that replaced the old Hale's Bar Dam. It is just barely north of 35 degrees latitude and would remain in Tennessee if Georgia should get to the US supreme court and get a ruling in their favor. Don't hold your breath for that one since there was a similar dispute between Tennessee and Virginia where the court ruled to keep the state line as originally surveyed. That's enough for tonight. It's late and I need to get to bed. More about the flight from Sunday, October 5th when I can get the pages created and edited for content. Check back here later as we still have to fly down into the heart of Alabama and over to Atlanta before this trip is complete. CLICK HERE for PAGE 274 Return to MAIN MENU.